U.S. Patio Systems and Home Remodeling is an authorized TEMO sunroom installer serving Minneapolis, Minnesota, and other Midwest cities. TEMO sunrooms have led the industry for more than 30 years, and have done so thanks to their superior engineering and vast array of design options. When you buy a TEMO sunroom, you are buying a painstakingly manufactured product that has undergone extensive quality control inside a factory setting. The team at U.S. Patio Systems and Home Remodeling will help you select the best sunroom design for your home, then customize it with features like carpeting, light fixtures, high SPF glass, ceiling fans – anything to help you get the most out of your new addition. Studio – Features a gently sloping roof pitch that works well with most one-story homes without the need for added construction. Cathedral – Features a vaulted ceiling that creates a dramatic architectural statement. TEMO’s cathedral-style sunroom is available in three sub-configurations: low cathedral, factory cathedral, and custom cathedral. 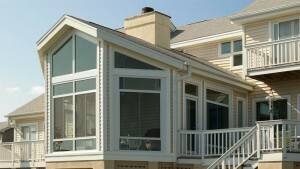 California – These TEMO sunrooms have a unique split-level design for capturing additional natural light and creating added architectural interest. Solarium – Bring the outdoors up close and personal with a solarium-style TEMO sunroom, available with a full- or partial-glass roof. Conservatory – TEMO’s conservatory sunrooms are available in square Edwardian or multi-faceted Victorian dimensions. If you have a screened-in porch but would like to upgrade to a TEMO sunroom, our factory-trained and -certified installers can simply convert your patio room into a three-season room with glass windows, enabling you and your family to enjoy the area more often throughout the year. For more information about having a TEMO sunroom in any one of the above styles added on to your home, contact U.S. Patio Systems and Home Remodeling, an authorized TEMO dealer serving Minneapolis, MN, and beyond. Be sure to ask about our convenient financing options. With our help, your entire family will be able to enjoy the outdoors without the threat of good times being spoiled by rain, wind, or pesky insects.